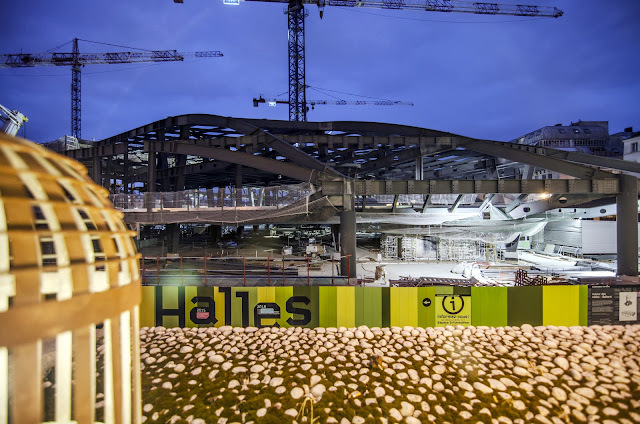 ParisDailyPhoto: Soon, the new Les Halles ! Those of you who came to Paris surely remember Les Halles, this large area in the very center of Paris that novel writer Emile Zola once called "the belly of Paris" (it used to be the wholesale market of Paris). Well, in the 70's they closed it and replaced it with a huge shopping mall that is now closed again and is in the process of being replaced by a brand new project still including a shopping area of course, but also a huge garden covered by a canopy. Well, that is precisely this canopy that I managed to catch on "film" from a restaurant. Not the most glamorous photo I posted, but interesting! Have a look at the final project here. The project will be nice, if it is finished to look like the architects' drawings. A welcome change: more open and welcoming. While the nooks of Les Halles of the past few decades may have reflected the medieval streets of old Paris, I always found it scary, like there would be a highwayman (robber) behind every corner. Were you at Au Pied de Cochon again? On a bad note: I read that a man committed suicide in Notre Dame today. Always a sad thing. I haven't been to the Pied de Cochon in... ages ! The "Three Musketeers" used to live there??? > Yes someone committed at Notre Dame, which is always sad, but I read he was ill and about to die of cancer. He "took advantage" of this (I know it sounds terrible) to kill himself and make a political statement. Eric, I hope you remember me, Petrea's friend from Pasadena, who was living in England last year. Some Pasadena friends and I will come to Paris on Friday and stay for two weeks. (We all read your blog now.) I'm bringing you a signed copy of Petrea Burchard's book, "Camelot and Vine." Do you have time to meet for coffee any day between Saturday and June 4? We're staying at Hotel Jeanne D'Arc le Marais. Hey Linda, yes, of course I remember! And of course I have time for a coffee - and to collect Petrea's book!) ! Please email me (eric@parisdailyphoto.com) when you're here. Is there a more boring thing to do then go shopping at a modern mall I ask. Probably not. It will not all be about shopping! There is going to be a stunning garden and plenty of non shopping activities! Will all of the old structure be gone? I'd love to go to Les Halles with photos of the past, and try to figure out where everything used to be. Oh! Just saw Linda's message. She called me this morning for your email address. I wish I could go to Paris with her! Yes I so wish you could deliver your book yourself! The original had character (and rats); what they replaced it with in the '70s looked like a mall in Anywhere, USA to me. I'll try to be nice and reserve judgment at least until I've seen the latest version—but your photo is intriguing. You're right, I did not really like the previous, modern Les Halles, but this one really looks promising!